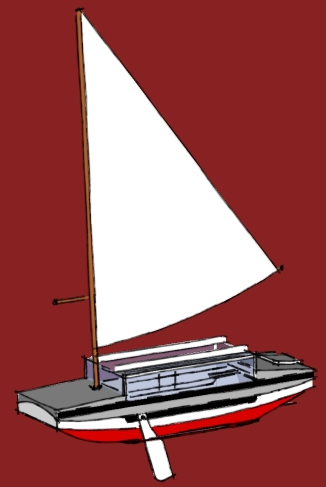 Triloboats, boats YOU can build! 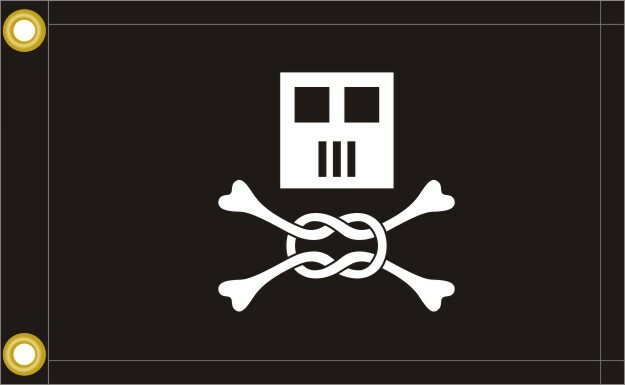 The Square Boats Flag, "the Knotty Roger"
The Trilobyte 16X4 was entered in a Duckworks Magazine design contest (entry #8). We drew up study plans for the contest, which are NOT included with the Plan Package. Please view or download these to evaluate the design for your needs before ordering. Full Cabin Expedition Cruiser for two adults plus. Based on Phil Bolger's Birdwatcher concept. Cost is $125. This includes shipping and handling. If you'd prefer to pay by check or money order, please email us to make arrangements. Unlike most plan packages, purchasing the package confers the right (non-transferable and non-commercial, please) to build as many Trilobytes as you wish. We intend it to be possible for you to build for each adventure. Please contact us to discuss terms if you represent a commercial, educational or charity interest. Mary Elisabeth, Andy Stoner's T32X12. StudyPLANs are actual plans (as opposed to a studyplan). 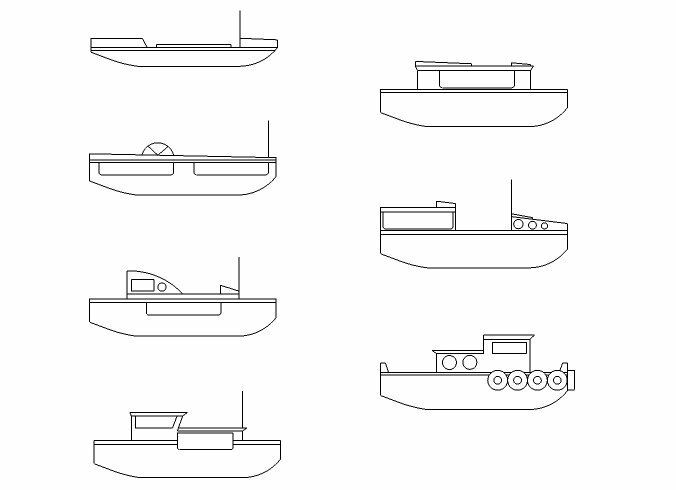 They contain all the ‘dots’ necessary to build a particular set of TBoat hulls (interiors, rigs and deck arrangements are left to the builder). 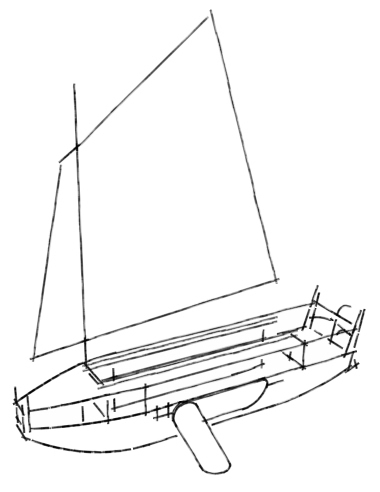 Each is for a given TBoat length, and covers the various beam options for that length. They are not like ordinary plans in that methods and materials are suggested, rather than specified. These are 'open designs,' and require your active participation. Unlike the T16x4 Plans Package, these StudyPLANs are for those who feel confident in their ability to research and draw their own conclusions regarding methods and materials. 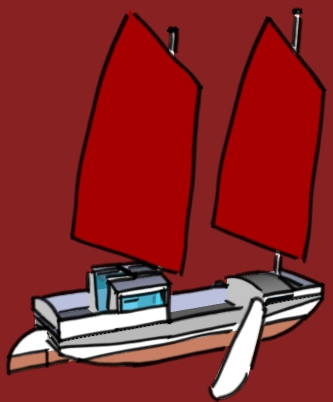 For others, they may be enjoyed as an ordinary studyplan, with the understanding that more specific plans will not be forthcoming (see TBoats DIY: Design and Build Your Own). When you purchase StudyPLANs using the PayPal links below, the appropriate StudyPLAN package will be sent in Adobe PDF form to the email address used to place the order. These orders are processed by hand—you will not automatically receive a download link! Orders are processed as soon as we check the email, so there may be a little lag time. NOTE: StudyPLANs do NOT include a copy of the Lenihan heater plan! The heater must be purchased separately if you're using StudyPLANs. Email us to pay by check or money order. NOTE: We placed the off-center boards differently than shown in the StudyPLAN. See this erratum regarding the difference! The MATCHBOX T20x4-8 StudyPLAN offers a collection of styles, approaches and ideas centered around a single side panel layout. Mix and match styles to suit your intended use, whether it be sailing, touring, workboat or minimal living aboard. 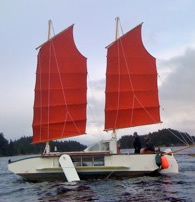 The Not-A-Gull tender is similar to Phil Bolger's much-loved Gloucester Light Gull. It can be carried, launched in surf, and offers a variety of seating arrangements and rowing positions. Read more in our essay Love Me Tender. The Trilobyte (T16X4) plan package includes a schematic for the Lenihan Charcoal Heater, a compact, tube-chamber heater for small spaces. Peter Lenihan invented the concept, and used a simpler version on his Bolger MICRO in temps to -20° F (burning a 5 briquette stack). Many people have expressed interest in the heater independently of the Trilobyte package, so we offer the schematic for $10.00 U.S. This one-sheet StudyPLAN illustrates the concept, from which the builder can adapt to their situation. It uses standard plumbing hardware, but specifics are up to you. To purchase the Lenihan Heater StudyPLAN only, use the PayPal link below. When we receive notification of your payment, we will email you a PDF copy of the schematic, a one sheet drawing of the heater's components and suggestions for construction. Avast, ye curvy dogs! 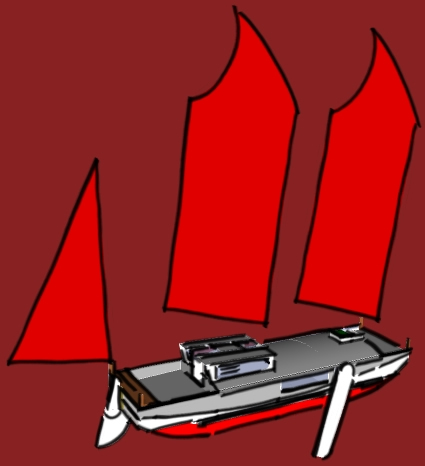 Fly the banner that proudly symbolizes the square boat philosophy! This high quality flag is constructed of heavy duty nylon with taped edges all the way around, and study grommets, it should last a long time in any weather. Flag measures 12" X 18". I'm in the (lengthy) process of writing a book which will allow anyone to design and build their own TBoat. It will supplement and surpass the studyPLAN series, and cover methods and materials, but will be a while before it becomes available. Please check back for the latest developments.